Today the Natural Grocers team visited the Scheels store in Reno. Scheels is the worlds largest sporting goods store. Awesome place! They are also a Blue Bicycles retailer which is the bike our team is sponsored by. Each entrance of the store has huge aquarium arches. Pretty amazing. This is the Gary Fisher museum in the store. Really cool stuff. here is the team with Scheels bike shop employees. Thanks for the hospitality! Yes they have a 3-story ferris wheel in the store. This is more of a mall than a single store. Amazing. Last night was stage one of the Tour de Nez in Truckee, CA. It was a 60-minute criterium and on about lap five Chad Gerlach and my Natural Grocers teammate Jon Baker attacked and went on to stay away for the entire race. 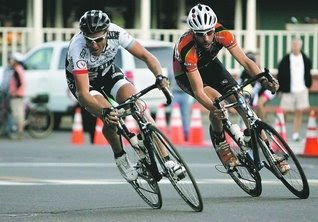 With about five laps to go the two-man break lapped the field and duked it out for the victory within a 40-man field. Here is a race report from Velonews. Here is the race report from the Reno Gazette. My race went smooth and the rest of the Natural Grocers team did an amazing job of covering every move that attempted to chase. I put out a big effort leading into the final lap to help Baker stay at the front. Gerlach was my teammate on two teams back in the late 90's. The most amazing results I witnessed by Chad were two stage victories in the 1998 Tour de Langkawi, Malaysia. That year our team was even first place in the Team Classification ahead of Mapaei with only two stages to go in large part due to Chad's placings. Today is the downtown Reno criterium which is a crazy technical .79 mile loop with 10 turns! Wow holy cow get to the front!